Tuna fish was not a big part of my childhood diet, but I definitely remember the endless jokes about Julie's tuna casserole on "Welcome Back, Kotter." But tuna fish manufacturers were big on catchy commercials. Who can forget "Ask any mermaid, you happen to see. What's the best tuna? Chicken of the sea!" And I'm unsure why all these 1970s housewives were so desperate that the government approve of their canned tuna. And that wasn't the only memorable ad. 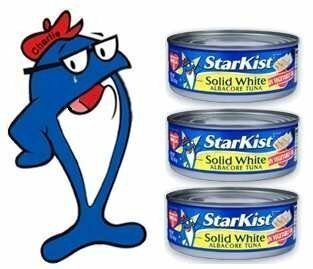 Slick Charlie Tuna had good taste, he claimed, but that wasn't enough for those bastards at Star-Kist. Sorry, Charlie! Star-Kist doesn't want tuna with good taste, Star-Kist wants tuna that taste good. They almost made tuna look like something I'd want my mom to buy. But not that much.